Adventures in the Komodo National Park promise a lot of new and attractive experiences and. 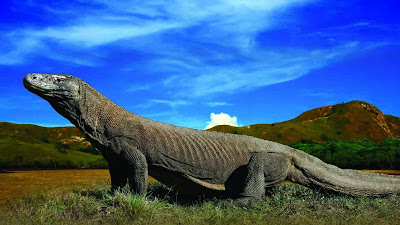 You can watch Komodo directly and from the close distance in its natural habitat and see them lying down near the official’s house. Besides the Komodo, this national park area also has awesome diving and snorkeling spots. Its natural beauty is very beautiful. Komodo and Rinca Islands have pure ocean and white sandy beaches, mangrove forest and savannas. While, you can enjoy a pinky sandy beach at the Red Beach (Pantai Merah). It is a very unique one. It is said that a beach like this is limited and there are only seven beaches in the world. If you are lucky, you can see swimming dolphins, green turtle and whales in the waters. For the accommodations, you can rent a house and Komodo National Park Management (PT. Putri Naga Komodo) also provides restaurants. The tourists who come to Komodo Island usually stay in a rented motorboat. Meanwhile, a lot of visitors who come to Rica Island are from Labuhan Bajo and they stay in hotels in Labuhan. Many gift shops for souvenirs will be found at the beginning of your arrival at Loh Buaya and Loh Liang. Noticing the Komodo behavior such as feeding, hunting prey, walking ways, etc. Swimming and snorkeling at the beach where the water clear and the reddish sand plus thousand kinds of fish and blue corals. Visiting the traditional village to see a different lifestyle with yours. Most of the local people also can communicate using their vernacular and Indonesian language. Just follow the tour held by the trusted service bureau to save your time, money, and energy. Bring sunblock or sunscreen cream, comfortable clothes, sunglasses and hats or sun coverings. 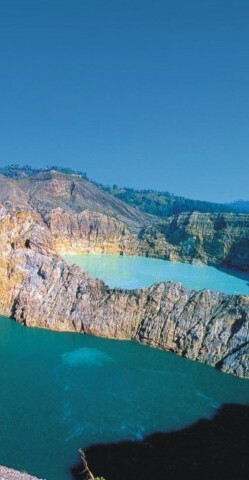 The Kelimutu Lake is located at the peak of Kelimutu National Park. The uniqueness of this lake are unpredictable changing of the colorful lake water. Sometimes, the water can look bluish, greenish and also dark. In the other chance, it can be whitish, reddish and some time ago the water was dark brownish. The local people believe that it is a rest-place for the dead peoples’ souls. Besides it is famous in its unpredictable changing water color, Kelimutu National Park also becomes a habibat for almost 19 endangered birds species, some of them are : Punai Flores (Treron Floris), Wallacea Owl (Otus silvicola), Sikatan Rimba-ayun (Rhinomyias oscillans), Kancilan Flores (Pachycephala nudigula), Sepah Kerdil (Pericrocotus lansbergei), Tesia Timor (Tesia everetti), Crested Opior (Lophozosterops dohertyi), Thick peaked Opior (Heleia crassirostris), cabai emas (Dicaeum annae), kehicap flores (Monarcha sacerdotum), matari Honey bird (Nectarinia solaris), dan EagleFlores (Spizaetus floris). The Kelimutu National Park’s size is not big enough. But you can enjoy the nature’s beauty and the awesome wildlife here. There are also three lakes with the same name on the top of Kelimutu Mount. Those three popular lakes are known as Kelimutu Lake. Ever lake has its own color and meaning and the local people believe that it has a powerful natural force. The East Lake is called Tiwu Ata Polo that means “a lake for peoples’ souls who always do crime”. The west lake is named Tiwu Ata Mbupu or “a lake for old peoples’ souls who have died”. While, the middle lake is for the young souls died” or often called Tiwu Nuwa Muri Koo Fai. To reach the lake location, you can start from Moni, a small island that is used as a base camp for the backpackers. The views along the street to the lake are very impressive. The spectacular nature panoramic is really rare could be found in other side of the world and has attracted the geologist’s attention to observe it. The local people believe that Kelimutu Mount is a holy mount and source of fertility of the ground around it. While, the scientists believe that this lake was formed by the volcanic eruption in the ancient time. Kelimutu area is surrounded by forests that consist of various scarce plants that only can be found in Flores.